Greek mythology is one of the single most well-known and frequently taught mythologies in the world, similar to that of its cousin, Roman mythology. Partly because its stories have survived so well and partly because it’s so old, it’s become extremely influential in the modern world and especially in fiction. Our planets are named after the Roman equivalents of its gods, and many of our favorite fantasy beasts come straight from its bestiary. Of course it’s no surprise that Zelda has an abundance of references to Greek mythology in it as well, but what is surprising is that most of them are little more than just that: References. With a few exceptions, most of Zelda’s nods to Greek mythology are nothing more than names, or borrowed archetypes and imagery. There are however an abundance of these references, and so I shall go over them. First off are the cases of borrowed names. While it still has many names that are made up or that have inconsistent origins, A Link to the Past contains a surprising amount of Greek and Roman names. The Tower of Hera, the third dungeon of the game, borrows its name from the Greek goddess Hera, with whom it shares no other similarities except perhaps for its place on the top of Death Mountain, just as Hera ruled alongside her husband Zeus on Mount Olympus as Queen of the Gods. The Roman equivalent of Aphrodite, the goddess of love and beauty, was called Venus, a name which is borrowed by the Queen of the Fairies of A Link to the Past, found in the Pond of Happiness in Lake Hylia. Other than being arguably beautiful (dem sprites) she has no other similarities, though the Great Fairy Fountains in The Wind Waker are adorned with scallop shells identical to the one that Aphrodite was said to have emerged from the ocean riding upon. Then there’s the Titan’s Mitt, an upgraded Power Glove, which is named after the Titans, deities who predated the gods and whose leader was the father of the gods. It was clearly named after them for their immense strength. In a similar way to how names have been borrowed, several creature concepts and archetypes have been borrowed as well. Some of these exactly resemble the original monsters from Greek mythology, while others mainly share core similarities. The Cyclopes for example were a race of one-eyed giants, who are copied directly by the Hinox from, once again, A Link to the Past (though they also appear in later games). While these creatures are also heavily based on creatures from Eastern myths, their single eyes are clearly inspired by the Cyclopes. It’s also fun to wonder about how many one-eyed creatures there would still be in Zelda had it not been for the famous Cyclopes. Then there are the Lynels, which date back to the very first Zelda game. While they have heads like lions, these beasts are still effectively horses with the torsos of men coming out where the head would be, making them virtually identical to the Centaur of Greek mythology. The Tarosu/Taros/Talos from A Link to the Past are bull-faced men, likening them to the Greek Minotaur, while one potential translation of their name reminds of Talos, whose archetype is shared by Eox from Phantom Hourglass. Talos was a bronze man who protected Europa on the island of Crete from invaders. Talos’ vein, sealed shut by a nail, reminds of the weak points over Eox’s body that must be smashed to shatter his body, as does the fact that he appears in a game where you sail between islands, one of which he protects much like Talos does. A certainly unintentional coincidence that is nonetheless extremely entertaining is that Daedalus was sometimes said to be the inventor who made Talos, whereas he also built the Labyrinth that housed the Minotaur; both the Tarosu and Eox potentially relate to Daedalus. The Staldra of Skyward Sword is also a clear reference to the Lernaean Hydra, a serpentine beast with many heads that could regrow twice as many as were cut off. The last three letters of its name appear to mimic that of the Hydra as well. Not all of Zelda’s references to Greek mythology are purely borrowed names and archetypes, though. Sometimes creatures have been completely copied over… or close to it. 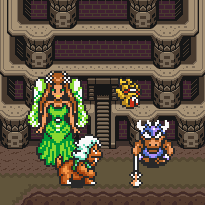 Take for example Medusa Head, the boss of the eighth dungeon in Oracle of Seasons. 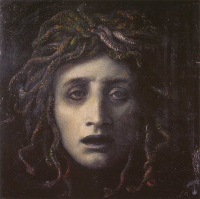 Medusa, of course, is a famous character and creature in Greek mythology and was a creature known as a Gorgon, who was originally always a monster but was later envisioned as a beautiful woman who was cursed by the goddess Athena into her current form. Gazing upon her would turn you into stone, just as Medusa Head has the ability to stun Link. Additionally, General Onox from Oracle of Seasons was originally called Gorgon in the Japanese version, though this is little more than a borrowed name like that of Tower of Hera and Venus. Giants, also, while appearing in many mythologies, are prominent in Greek mythology, although here they are generally depicted as villains — they attempted to take over Mount Olympus — whereas the Four Giants in Majora’s Mask are benevolent protectors. Mermaids are not exclusive to Greek Myth either, but they are often likened to the Sirens who do originate there. However, the Sirens were dangerous temptresses who would lead sailors astray, while the mermaids in Zelda are benevolent: In Link’s Awakening, you must retrieve the mermaid Martha’s necklace (or her, erm, top, in the original version), while in Phantom Hourglass, mermaids are referenced and Jolene’s sister, Joanne, dresses up as one. The Old Wayfarer seems to leave his family for her, and that combined with retrieving Martha’s top seems to at least keep the temptress aspect intact. Better examples of the malevolent Sirens might be the Cubus Sisters, also from Phantom Hourglass, although they’re only really depicted like Sirens in the manga; in the game they simply haunt the Ghost Ship, though they do try to trick Link. Some other references and similarities exist in the series. As I wrote before in an article about mythical birds in Zelda, owls have mostly been portrayed as evil or as harbingers of death in mythology and folklore; the only source of wise, helpful or otherwise benevolent owls comes from Glaucus, the Owl of Athena, who was the goddess of wisdom among other things. Clearly, it’s Glaucus who inspires wise and benevolent owls in Zelda, like Kaepora Gaebora and his predecessor in Link’s Awakening. Athena, also, would appear to serve as some form of inspiration for or at least a parallel of some of the Goddesses, particularly Nayru, as they both embody wisdom, but even Farore, as Athena embodies courage as well. Throw in that she is also the goddess of “strength”, and she can even be equated to Din. Let’s just call her the catchall goddess, okay? Even the iconic image of the mythological Greek figure Atlas carrying the earth — though in the myth he actually carried the heavens — appears in Zelda: The Brawny Canon, part of the Golden Train Part set in Spirit Tracks, looks identical to the popular depictions of Atlas, though he carries a bottle and not a globe. 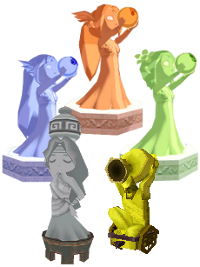 Similarly, the image of the Zodiac sign, Aquarius the Water-Carrier — a person carrying a pot filled with water — is mimicked by the Fountain Idol decorative item in The Wind Waker, and even Sue-Belle from Outset Island in the same game. The Zodiac does not originate from Greece but the current names are Roman, and the Fountain Idol even appears to wear Greek garb. As do the three statues of the Golden Goddesses, found on the Triangle Islands surrounding the Tower of the Gods. The Tower of the Gods itself appears to loosely mimic the architecture of Greek temples in some ways, and given how The Wind Waker refers to the deities as simply “the gods” instead of “the three Goddesses” or “the Golden Goddesses”, many more parallels with the Greek pantheon of deities can be drawn. Jovani from Twilight Princess, also, brings to mind King Midas, whose touch turned things into gold. Both characters were punished for their greed. The Shadow Temple appears to be a depiction of the Underworld, which has an appearance in Greek mythology, and in particular the ship that’s claimed to be a “ferry to the other world” seems to be based on Charon, the Ferryman of the rivers Styx and Acheron in Greek mythology, who transports souls over the underworld river in his boat. The Poe Collector from Ocarina of Time and Majora’s Mask seems to have some similarities to Charon as well, as he carries a stick like Charon’s oar and deals in souls, particularly in Majora’s Mask where he watches over the souls of four minibosses who want a rematch with you from the afterlife. The only other references I can think of are pretty minor. Link’s journeys across fantastic islands in his seafaring adventures could be considered similar to The Odyssey, where Odysseus journeys across many dangerous seas and islands on his way home. The dungeons in the original Legend of Zelda were called Labyrinths, a word which can be dated back to the famous Labyrinth built by Daedalus, which housed the Minotaur, as mentioned earlier. Lyres have major importance in the Zelda series, as shown in Ocarina of Time, Skyward Sword, and Oracle of Ages (although they are always mistakenly called harps, which are actually different instruments). Lyres date back to ancient Greece, although they were not really mythological even if Zelda’s ones sort of are. And that is all I can find, although with how significant Greek and Roman mythology are, I would not be surprised if there are other references I have missed. Certainly, there will be more in future games. We can be sure of that. Zelda has borrowed immensely from Greek mythology in the past, making countless references to it, some big but many small. Zelda owes some of its creatures to these myths, and in particular much of A Link to the Past seems to be based on them, as is one of the few depictions of the Golden Goddesses. 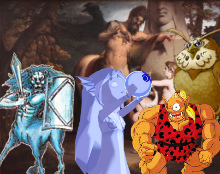 Perhaps, in the future, we will see more notable references to Greek mythology like these, and ideally, Zelda will borrow more from the mythology’s impressive collection of monsters. Who wouldn’t like to see a Chimera in a Zelda game? So, what do you think of all these references, borrowed elements, and connections? Are you familiar with Greek mythology, and if not, did you learn anything? Did you know of these references already, and can you identify any more? Tell me in the comments!